The Commissioner of Dhaka Metropolitan Police (DMP) is Mr. MD. ASADUZZAMAN MIA BPM(Bar), PPM. He joined his current position on January 7, 2015. Mr. Md. Asaduzzaman Mia was born in the district of Faridpur in 1960. After attaining Master of Science (MSc) degree, he joined Bangladesh Police as a Civil Service Cadre in 1985. Having successfully completed Basic and Foundation training. Mr. Md. Asaduzzaman Mia has served several important units of Bangladesh Police effectively and efficiently. His glorious career has been furnished with positions like SP of Sunamganj, SP of Pabna, SP of Tangail, SP (Railway) of Chittagong, SP (Railway) of Syedpur, CO of 1st APBn, Bogra, Additional DIG and Commandant of Police Training Centre (Noakhali), DIG (Khulna Range), DIG (Chittagong Range), DIG (Dhaka Range) and DIG (Highway Range). Mr. Md. Asaduzzaman Mia received training in several police related issues in order to serve the citizens better. He successfully completed Crime Prevention Course for Senior Foreign Police Officers from Japan. His areas of special interest are Field Level Management of Crime Prevention, Traffic Security and Traffic Management. The current DMP Commissioner played a vital role while working in a UN led peace keeping mission in Mozambique. In personal life Mr. Md. Asaduzzaman Mia is happily married and blessed with two sons and a daughter. He loves to read books and enjoys gardening when he can manage time. Mr. Md. 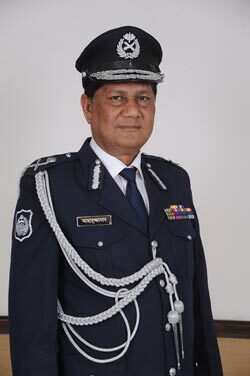 Asaduzzaman Mia has been serving Bangladesh Police courageously and sincerely, with competence, integrity and dedication. For his great contribution he has been awarded with the prestigious Bangladesh Police Medal (BPM), President Police Medal (PPM) and IGP’s Good Services award as well. The team DMP has been performing its duties successfully under the Police Commissioner’s prudent leadership and guidance against all odds in order to ensure a better and safer Dhaka.